We review the top 5 mechanical keyboards from Logitech, HyperX, Razer and Corsair to find the best gaming keyboard ​2019 has to offer. We put in hours of testing and research and, beer spilling (more on this later) and have finally settled on the 5 best keyboards for gaming. 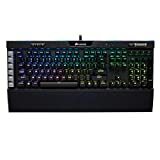 This buyers guide is constantly updated to provide you with the top gaming keyboards available on the market ​for 2019. These days you can find gaming laptops that are able to run the best PC games at stable frame rates some models can even handle everything in 4K. A few years ago, you would be crazy to try and play "real" game on a laptop. But, times have changed with high spec gaming laptops being produced by Dell, Asus, Alienware, Gigabyte and HP. We have put hours of research and testing into this gaming laptop buyer guide of the 10 best gaming laptops available in 2018. The Romer-Gmechanical switch is purpose-built for pro-grade performance, responsiveness and durability. The Logitech G413 Carbon keyboard is undoubtedly one of the best gaming keyboards on the market right now. This advanced keyboard is equipped with a full set of function keys including light controls, media controls, and game mode settings. The backlighting of the keyboard is available in either silver or gray. Because of the single-color backlighting, the Logitech G413 Carbon does not offer lighting playback. It's incredible durability, however, compensates for the single light color. It has a brushed aluminum-magnesium alloy top and a durability of 70 million key presses. With a light build, a weight of 2.4 pounds, and equipped with a 6-foot cable, it offers the most mobility in agile game play. Its performance is incredibly difficult to beat. The keyboard’s short-throw actuation is 1.5mm. This excellent speed helps to optimize your game play. With its advanced and user considerate design, HyperX Alloy Elite keyboard is another of the best gaming keyboards. The keyboard is designed to be durable and usable. The keyboard not only has media buttons but is also readily equipped with both anti-ghosting keys and game-mode keys. The back lighting comes in only a single, vibrant red, but the vibrant color ensures that all the keys are visible. The lighting emanates from an 18 LED light bar that is integrated into the keyboard. The HyperX Alloy Elite is a keyboard that is intended to last. The key caps are titanium-colored to ensure this promised durability. It is also a keyboard that keeps the gamer in mind. The provided wrist rest gives you the best possible comfort while gaming, ensuring that you play the best game you possibly can. The anti-ghosting keys help to ensure that you do not miss crucial keys that could end up losing you an intense game. This combined with the speed that the keyboard technology provides makes it a great keyboard for gaming. While the HyperX Alloy might have a couple drawbacks, its lighting and comfort are enough to ensure that you have an optimal gaming experience. The keyboard is fantastically durable, which is what makes it one of the best gaming keyboards. The Razer BlackWidow Chroma V2 brags of an 80 million keystroke durability, which makes it perfect for intense nights spent gaming. It is also fully equipped with multi-colored back lighting. Therefore, lighting playback is entirely an option with this keyboard. Furthermore, the keyboard is designed which each gamer’s comfort and preferences in mind. The keyboard comes with a wrist rest to improve comfort while playing. The BlackWidow also comes in a variety of colors and styles including Cherry MX Blue, Quartz, Razer Green, Razer Orange, and Razer Yellow. Every player’s game is different, so why shouldn’t a quality keyboard express these different styles? It is also fully equipped with multi-colored backlighting. Therefore, lighting playback is entirely an option with this keyboard. With a keyboard designed so specifically for the necessities of a gamer, it is a high-quality purchase for gamers of any skill level. 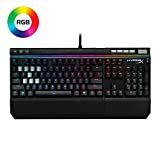 The Corsair K70 RGB is a keyboard that is ingrained with the durability required for being a quality gaming keyboard. The letters on each key are in a large font. Beyond the letters, the keyboard has multimedia controls. The Corsair K70 RGB also offers multicolored lighting. Alongside the multicolored lighting, it offers light programming. Light programming is important to playing your best game because it helps to color code your keys, making the important ones easier to find when they are needed. The frame is also incredibly durable. The anodized brushed aluminum frame helps promote this increased lasting capability. The Corsair K70 RGB is aircraft-grade. The keyboard also only weighs 2.65 pounds. The Corsair K70 RGB is nothing if not a performance-based keyboard. It is an incredibly high-speed keyboard. Speed while gaming and can either cost or attain a victory. The high-speed performance of this keyboard is a large part of what makes it one of the best gaming keyboards. With the exciting speed and durability that the Corsair K70 RGB offers, the keyboard stands up as a worthwhile purchase for any gamer. The K95 RGB Platinum is another one of the Corsair keyboard that stands up to testing as one of the best gaming keyboards. The keyboard features the ever-beneficial anti-ghosting technology. This anti-ghosting technology helps to ensure the utmost accuracy when you are playing. To ensure accuracy even further, the keyboard allows for hardware macros, multicolor backlighting and lighting playback. This way you can color code the power keys you will need to play for the most successful games. The Corsair K95 RGB Platinum is also designed for durability. Much like the Corsair K70 RGB, the Corsair K95 RGB Platinum has a frame that is made of anodized brushed aluminum that is aircraft-grade. This allows for not only durability but lightness. ​This incredibly durable and intelligently designed keyboard does not fall short when it comes to performance. The keyboard is incredibly fast with 1.2mm actuation and durability. The Corsair K95 RGB Platinum understands the importance of a fast keyboard in a great game. It also offers 6 programmable G-keys, all of which are geared to enhancing your gaming experience. This incredibly durable and intelligently designed keyboard does not fall short when it comes to performance. The keyboard is incredibly fast with 1.2mm actuation and durability. The Corsair K95 RGB Platinum understands the importance of a fast keyboard in a great game. It also offers 6 programmable G-keys, all of which are geared to enhancing your gaming experience. If you are looking for a strong keyboard to improve your already great game, look no further than the Corsair K95 RGB Platinum. Why are these the best gaming ​keyboards? We don't just randomly select some ​keyboards we like the look of and decide they are the best! We closely monitor the market and perform stacks of research, read multiple other review sites that we trust (see sources below) and read countless consumer reviews before doing any of our own testing. Why you should trust this guide? When tasked with selecting the best gaming ​keyboards we performed research using sites we use and trust provide good honest, well informed. All in all, the Asus ROG Zephyrus tends to set a high bar for thin and powerful gaming laptops and is able to deliver a quiet operation with exceptional performance and a design which has been deemed to be truly innovative. If you’re after a powerful thin gaming laptop with an excellent display we highly recommend the Asus ROG Zephyrus. The Asus Stix laptop is a full HD gaming machine, thanks to its excellent built in speakers and the vibrant screen (excellent color depth).